1. View our outage map. A circle on the map near your address may confirm an outage in your neighborhood. 2. Check with your neighbors to see if they have power. The outage could be a larger issue not yet on the map, or it could be isolated to your house. 3. If there isn’t an outage affecting your neighborhood, check to see if your circuit panel or fuse box has a tripped breaker or blown a fuse. If it has tripped, reset the breaker or replace the fuse. 4. Check your mast or the disconnect outside below your meter base (see diagram below). 5. Call us at 253-502-8602 to report the outage. Are your lights dim or completely out? Are your neighbors’ lights out, too? Can you see any damage, like a tree in a power line or a broken power pole? Did you see or hear anything, like a flash, fire or pop? 6. Turn off all appliances, water heater, computers, TVs, air conditioning and heating units, and lights (major appliances can be turned off at the breaker box). When power is restored, turn items on one at a time. Heavy instant demand when we’re trying to restore power can cause a secondary outage. For tips on food safety, see the Centers for Disease Control’s website. 7. Turn on a porch light and one inside light so you and our crews will know when your service is restored. 8. Use your phone (you can charge it in your car) or tablet to follow us on Facebook and Twitter for outage updates and information. 9. If your neighbors’ power comes back on but yours does not, please call us again and let us know. The problem may be isolated to your house. 10. Use generators properly. Improperly installed generators can seriously injure our crews. If someone in your household depends on life support, we may be able to prioritize returning power to your address if you’ve called us before the outage occurs. If someone in your household depends on life support, call us BEFORE AN OUTAGE at 253-502-8600 so we can make a note of it. Also, remember to prepare for an outage at your business. 1. Power distribution lines, poles, transformers and power neutral lines within our right of way. 2. 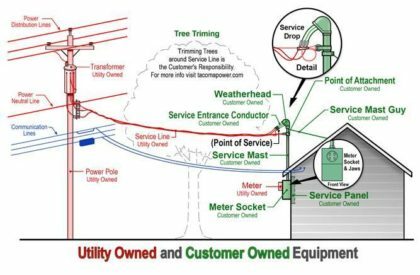 The power service drop or wire carrying electricity from Tacoma Power’s lines to the mast on your home or business (trees or shrubs under this wire on your property should be maintained by you). 3. The mast, strike plate and meter socket to your home or business (identified in the diagram). If electricity comes to your house through overhead power lines and your house is out of power, the problem could be your mast. Sometimes strong winds or tree branches can pull the mast away from the house during a storm. The mast, which is outside your home (either on your roof or at your meter) usually looks like a metal pipe. DO NOT TOUCH the mast. It is energized. If it looks loose, bent or damaged, you will need to contact an electrical contractor to get it fixed. The mast is part of your home, and therefore, your responsibility. Tacoma Power cannot restore power to your home until your mast is fixed. 4. Communication lines will be repaired or maintained by the local cable or phone providers. Turn electrical appliances on gradually. 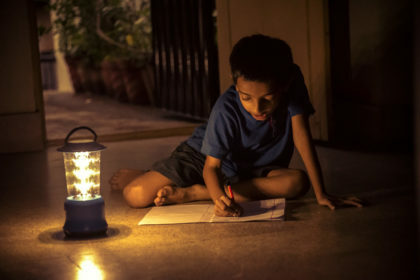 An immediate, heavy demand for electricity after a power outage may overload and damage equipment, causing another outage. Let Tacoma Power crews trim and remove trees and branches in the utility right-of-way to the extent necessary to restore electrical service. You will be responsible for removing and disposing of any fallen limbs and trees and other debris on your property caused by storm damage. We may require repairs to damaged service equipment before power can be safely restored. You are responsible for damaged electrical service equipment at your home or business. Only a licensed electrical contractor should attempt to work on these parts of your electrical system. An electrical permit will be required.